Thomas Durfee, a middle school physical education teacher, looks up as sophomore Julia Bonacorso cuts his hair Friday during an all-school assembly at Manchester Essex Regional High School and Middle School. 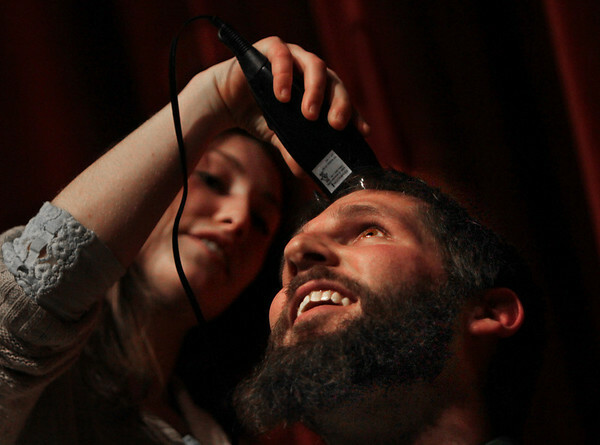 Durfee and two other faculty members allowed winners of a raffle to cut their beards any way they wanted to. Durfee also agreed to let the winning student cut his hair. Bonnacorso gave Durfee a sort of reverse Mohawk, with one shaved stripe running down the middle of his head and another to one side.